BollForte94 from table tennis daily wants to know what do you practice the most. Do you have a cetain training rechime each week or does it alter? It depends what period I am in, if it’s close to a tournament then I work on smaller things. For example right now before world championships I am doing a lot of serve and return. Yes, it has always been an area that I have to practice a lot. I try to do it most days that I practice. Your a very successful international star now, what do you feel was your biggest achievement to date? Commonwealth Games Silver in Team and this year getting my first ever national title in doubles with Chris Doran. When I was 18 had an injury in my elbow and it was a tough year coming back and playing. I was trying to compete but it still would cause me big problems sometimes mid competition. Right now my focus is on improving my World ranking to give myself the best possible chance of competing there. But as a sports fan I can’t wait! It is going to be amazing! TerIphik - Hi, I would like to know if the material (rubbers and blades) of professional players is the same to the same material as we (nonprofessional) buy in table tennis shops? Yes, for example I order my rubbers from Teessport which are the same rubbers as everyone else uses. Some top players like to choose specific things for the rubber like hardness and weight and so in that way they can have a selection. Do you use booster to enhance your rubber? lesliefrancs - HI, Is pursuing a life towards TT worth the rewards? and does playing TT full time effect your personal life? TT is a very challenging sport but it is definitely worth all the hard work and time I put into it. Playing for my country is a dream come true but of course it effects my personal life. I’m lucky enough to have a girlfriend who understands and friends who don’t mind not hearing from me for a while if I’m away a lot. No, my fitness programme is a mixture of strength work in the gym, cardio like running/cycling and speed and agility. GecaPhoenix - What's your view on the chinese dominniance at the moment, Why are they so good do you belive? A massive supply of players and the facilitites available so players can play without worrying about anything but table tennis. Also, they have guaranteed high level practice because there a large number of high level players. Leankints wants to know do you train on the mental aspects of the game. Do you find this side of the game is just as important as the technical parts? Yes it is very important, the higher the level, the more important it becomes. I am very interested in psychology and so I enjoy this part of the game as much as any other. I think it is just another aspect of your game that you have to practice every day. DaveCochrane - Hi, I would like to know what you want to do when your playing days are over, will you stay working in table tennis such as coaching etc. I want to study psychology at university and then have a career in probably sports psychology. I would prefer to have a choice between being a coach or taking a different route. forestloves - HI, would you rather Win the World Championships, or win a silver in the Olympic Games? I think win the World Championships, to be World Champion must be an amazing feeling as you are officially the best in the world. topgunwow - Hi, are you happy about the speed glue ban, has it had an effect on your game? I think it was a good thing, speed glue definitely was bad for people’s health. It hasn’t really effected my game, you just naturally adapt. I don’t think it had the effect of slowing the game down and creating more rallies as was intended. You have had a lot of recent big wins/ and you have been playing at such a high level. What do you think has caused this? I have always worked hard but senior table tennis is such a big step up. The level of international competition has such strong depth that you have to be solid in all areas before results come. What do you think could improve England TT as a whole to make us catch up with the likes of Germany? A strong league like Germany would dramatically improve English TT as it would attract good foreign players to the country, bring more young players into the game and increase competition within our own country. And lastly, what are now your future ambitions? Compete in London 2012, Win a European Gold medal, Be ranked in the top 50 in the World. Silver medalists Andrew Baggaley, Paul Drinkhal, Darius Knight, Liam Pitchford, Daniel Reed of England pose during the table tennis men's team awards ceremony at Yamuna Sports Complex during day six of the Delhi 2010 Commonwealth Games on October 9, 2010 in Delhi, India. Whos the most famous person you know through table tennis? Whos your favourite sportsmen of all time? What do you do in your spare time other then table tennis? Do you eat well or eat junk good? When I’m in training I really try to eat well as it affects your concentraion and length you can practice. When I’m having a week off then junk food is very likely. Whos the funniest player in the trianing hall? Whos trains the hardest in the training hall? Whos the funniest team player? Would you like to add one last tip, or an inspiriational message to us all? Always believe in yourself! Your motivation has to come from inside yourself. 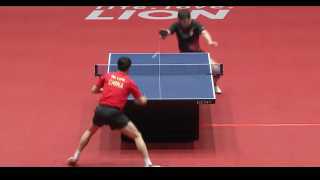 Watch Danny Reed/Chris Doran vs Paul Drinkhall and Liam Pitchford. The last set has some very impressive rallies. He looks pretty solid player..but i guess he would like to be much better than he is now. I wonder if he ever had a stint in china. Because I believe, he has to associate and train with the best, no disrespect to the European players whom I believe are very good indeed. We should compare the levels of 21 year olds in China with the rest of us. Any sports, dominated by a country will slowly but surely become a little stale internationally. More youngsters should train in China, because obviously their training methods are different than the rest of us, and a closely guarded secret. And I am not just talking a week to a month long stint. Basically, we should start basing our youngsters there, it works with football, why not table tennis. Maybe Dan, in the future if you manage to get an interview with a professional, I would be delighted if you may ask him/her, what is the best method( & I don't mean training methods) to develop the youngsters so they may compete with the best chinese players in the international scene. Timo, Samsonov, Maze and the likes won't be around forever. It's time to think about the future of table tennis and where it is heading. Thx for this interview, if anyone around the world want to fine more information about him, Google will lead him to here and that will helpful for they want to know about him. * The important thing is Concentration, Focus on the ball and when the ball approaching from you by 5 cm start to control on it and do what u want. - When you Making a topspin get back to right position to prepare to the next ball. Thx for the interview Dan..